Getting there. Starting point of expedition usually is Bishkek - the capital of Kyrgyzstan. International airport "Manas" (30km off Bishkek) accepts flights arriving from number of European and Asian countries (Hanover, London, Moscow, Sankt-Petersburg, Istanbul, Meshed, Karachi, Delhi, Urumchi and Sharjah). 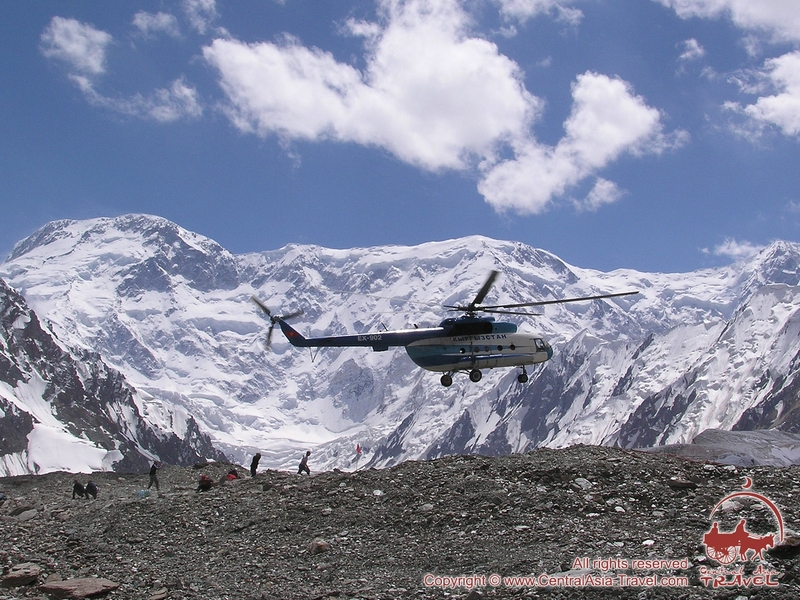 It takes one full day of driving to reach “Karkara Base camp”. 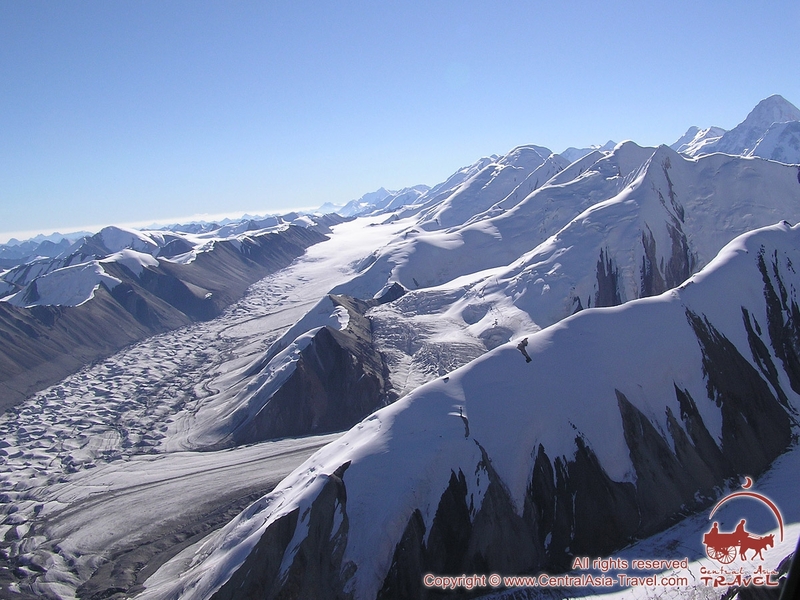 One more day is spent on a helicopter hop to Inylchek glacier to Base Camp (30 min). 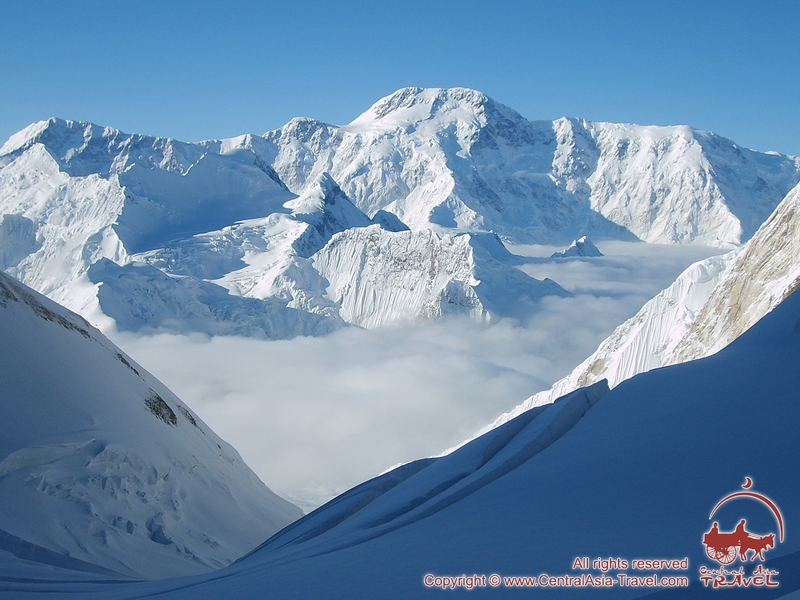 Tourism potential of the region is great: except world-known peaks Khan-Tengri and Pobeda there are more than 30 summits of 6,000 meters high and plenty of summits the height of which is ranging from 4,000 m to 6,000 meters in the uppers of glaciers South Inilchek and North Inilchek. The routes of ascent on the above mentioned peaks vary from simple to most complicated ones. 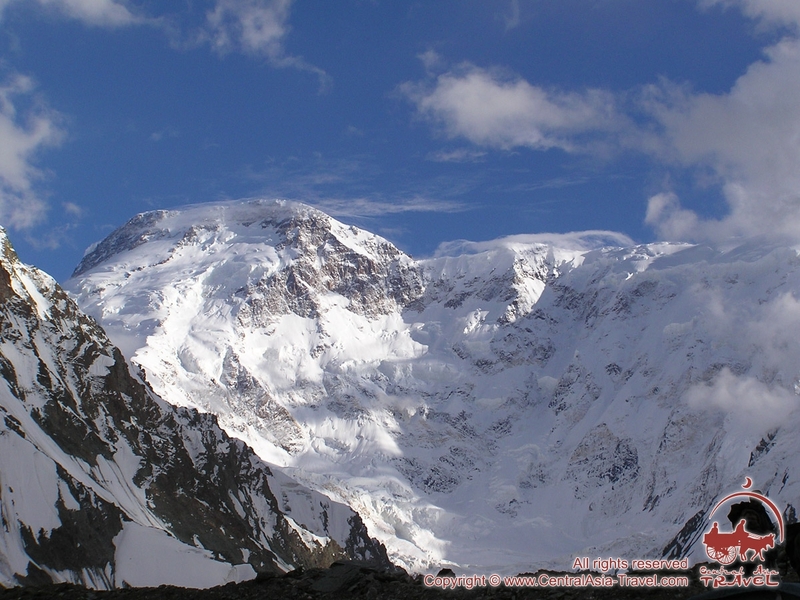 Area surrounding the peaks Khan-Tengri and Pobeda is rich in unclimbed summits. Foot trips to this area are limited due to difficulty in crossing of passes between valleys. 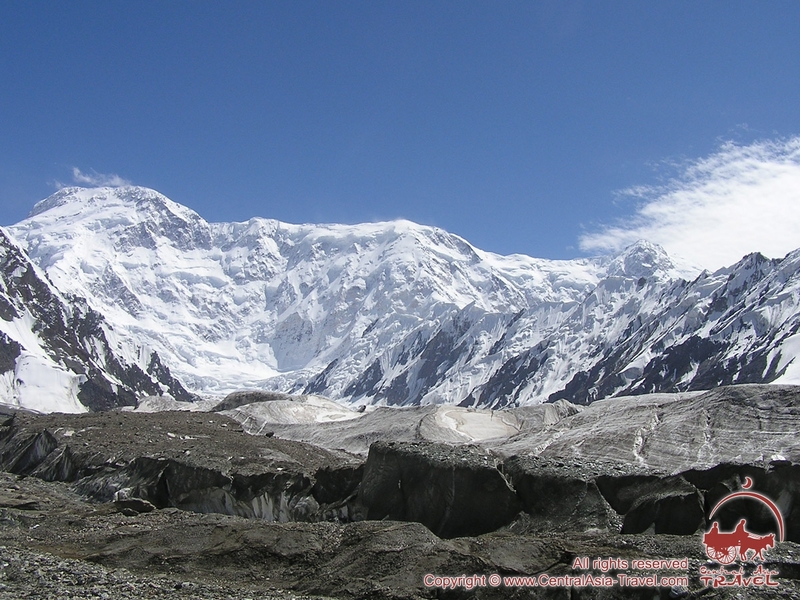 Most popular route before ascents to Khan-Tengry and Pobeda summits is trek starting from At-Jailoo base up along Inylchek glacier to the Base camp “Southern Inylchek”. 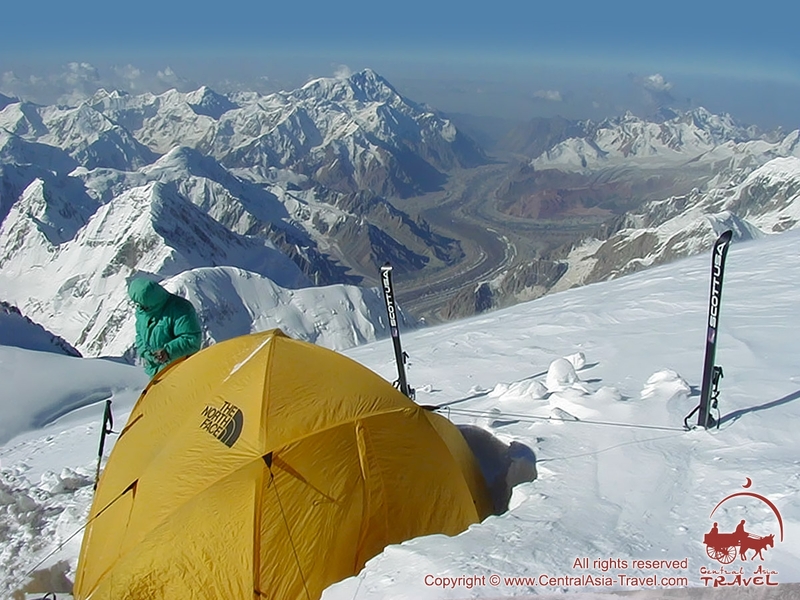 From the mountaineer"s base camp we enjoy the beauty of marble pyramidal peak Khan-Tengry and its neighbour - world"s northernmost peak above seven thousand meter peaks - Pobeda Peak. Day 2 Transfer Bishkek - Karkara BC (460 km). Accommodation in Karkara BC. Day 3 Helicopter flight to South Inylchek BC (4000 m asl). Day 4 Acclimatization and preparation for ascending. Day 5 Acclimatization and preparation for ascending. Day 6 Ascent to Camp 1 (4200 м). Day 7 Ascent to Camp 2 (5100 м). 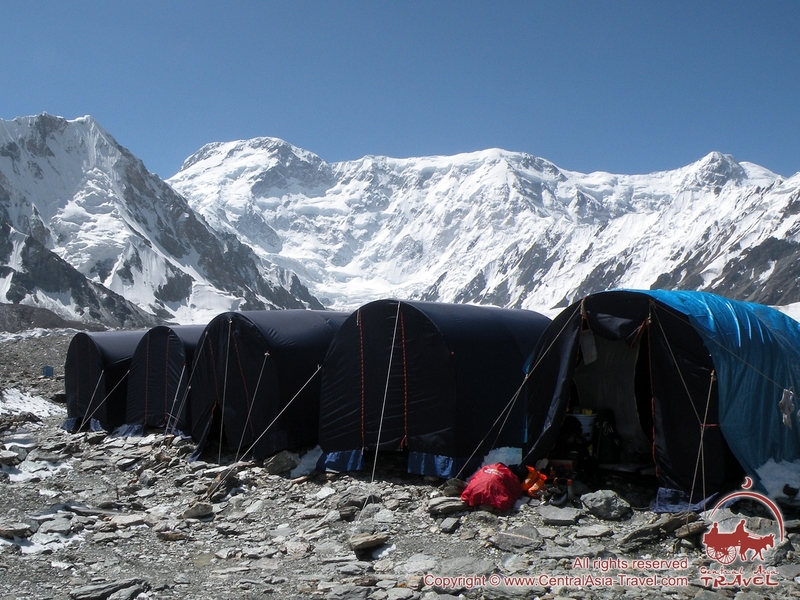 Day 8 Ascent to Camp 3 (5800 м). Day 9 Descent to BC. Day 12 Ascent to Camp 1 (4200 м). Day 13 Ascent to Camp 2 (5100 м). Day 14 Ascent to Camp 3 (5800 м). Day 15 Ascent to Camp 4 (6400 м). Day 16 Descent to BC. 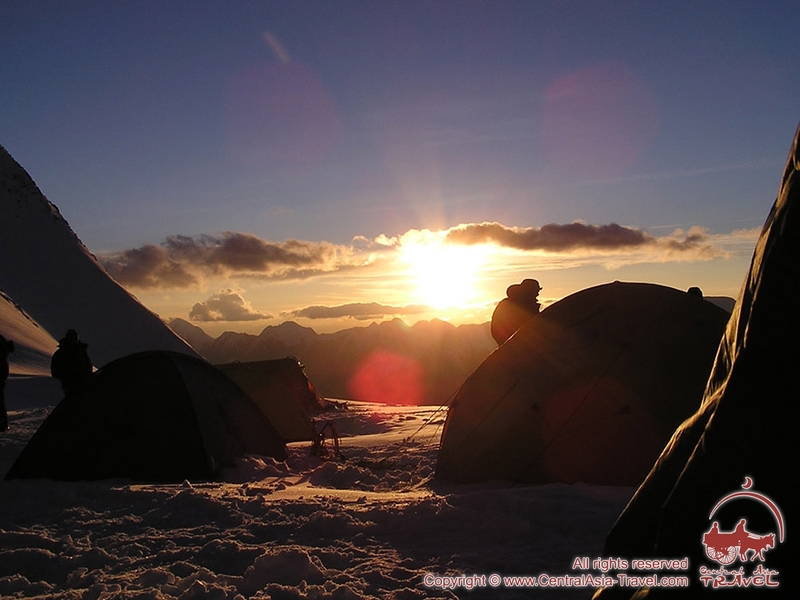 Day 20 Ascent to Camp 1 (4200 м). 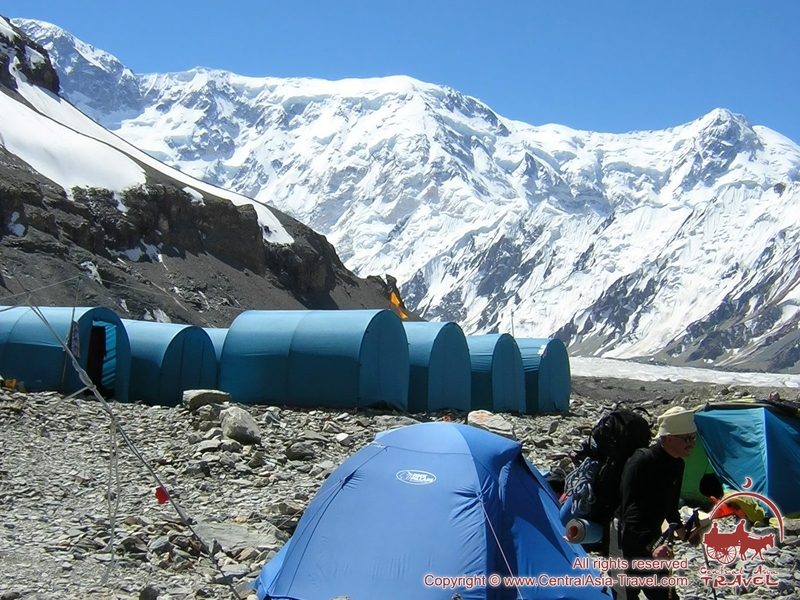 Day 21 Ascent to Camp 3 (5800 м). Day 22 Ascent to Camp 4 (6400 м). Day 23 Ascent to Camp 5 (6918 м). 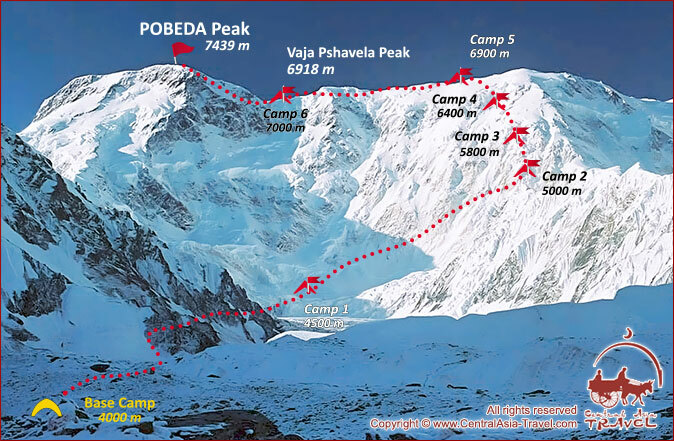 Day 24 Ascent to the summit Pobeda peak 7439 and descend to Camp 5 (6918 м). Day 25 Descend to Camp 1 (4200 м). Day 26 Descend to BC. 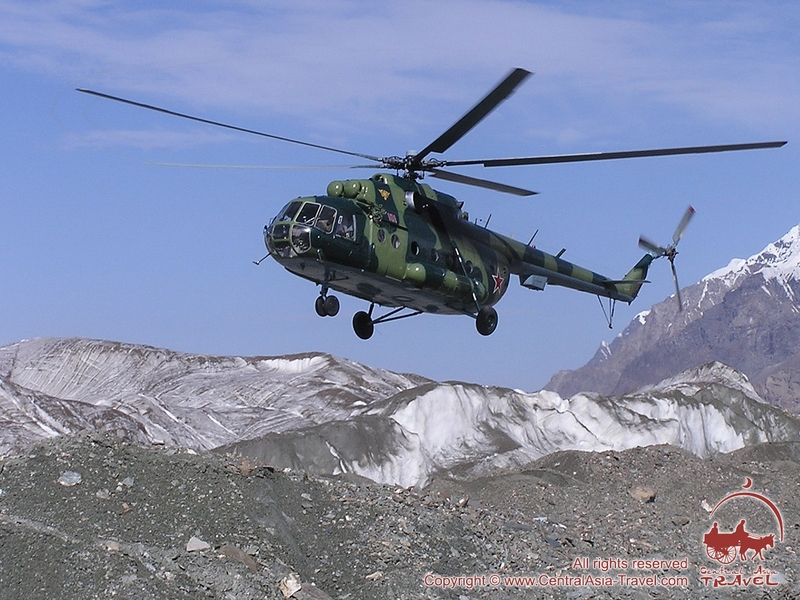 Day 27 Helicopter flight to Karkara BC. Transfer and accommodation in Bishkek. Day 28 Free day in Bishkek. Accommodation in a hotel. Day 29 Transfer to the airport and departure from Bishkek. - ecological tax for staying on the territory of the camp. • Gas canisters and petrol for stoves and burners. 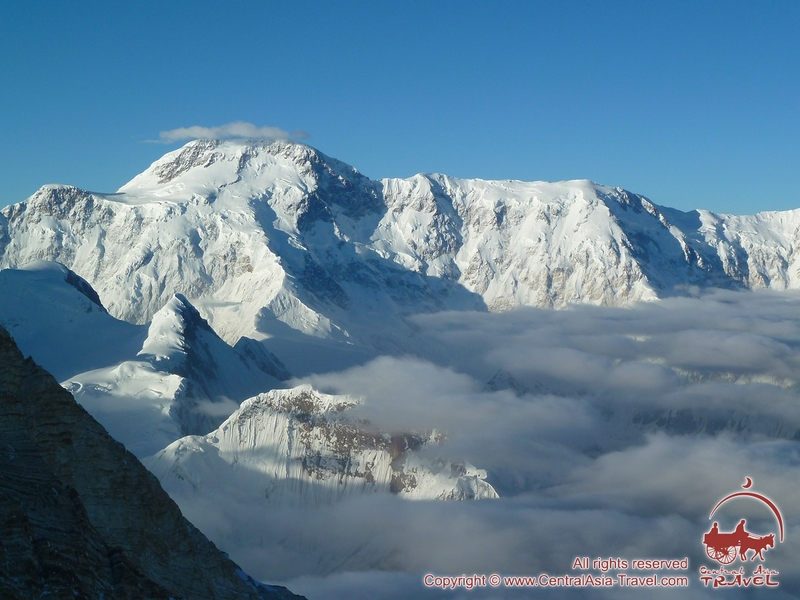 • Set of high-altitude products - 120 USD per person. • Rent of mask and oxygen pressure reducer - 300 USD. • Official registration with authorities of Kyrgyzstan. For issuing a frontier zone permit and for registration in the Ministry of Home Affairs’ authorities it is necessary (not later than 1 month before your arrival) to send us the following passport data: passport copy, or: your full name, date of birth, nationality, passport number, and planned period of your staying in Kyrgyzstan. There is a visa-free policy to Kyrgyzstan citizens of Russia and the countries of Commonwealth of Independent States. In the beginning of August 2012 a law “About introduction of a visa-free regime for citizens of some states within 60 days” came into force. According to this law, the citizens of 44 countries from the list below have a right to enter Kyrgyzstan and stay on the territory of this republic without Kyrgyz visa during 60 days (not longer). This considerably simplifies a possibility of coming to Kyrgyzstan, cuts down expenses, and gives a significant advantage to those of our travelers who earlier had to buy the package with the option of arrival and departure via Bishkek, as it was possible to get Kyrgyz visa only at the Consular department of “Manas” airport on arrival. Now participants from 44 countries may arrive directly to Osh by means of new flight of Turkish airlines TK-360, in case this option is more convenient to someone. Other options of arrival and departure (via Tashkent or Bishkek) are also available. 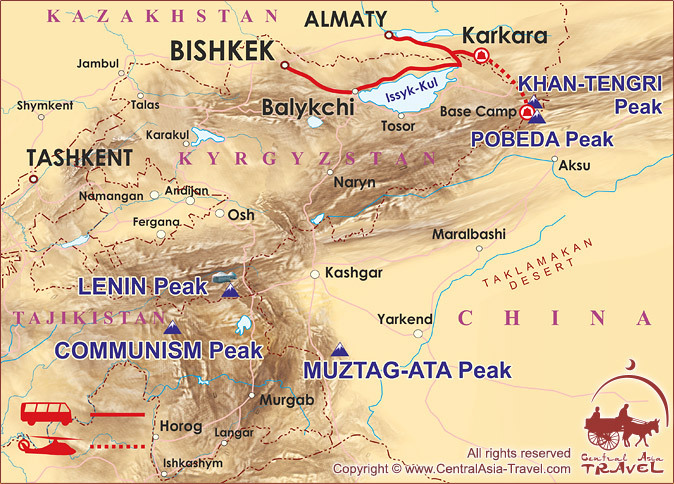 ** Note: The cost of the program includes climbing the both peaks: the Pobeda Peak and the Khan-Tengry Peak. The insurance is compulsory and always advisable in case of unforeseen circumstances. Common sense has to provide it in order to feel safety on a mountain, as the services of rescue team costs a lot. 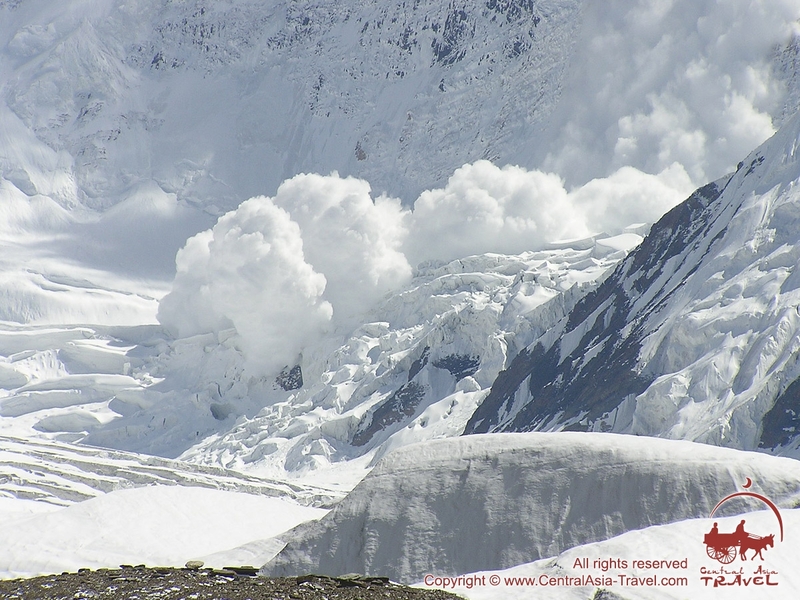 We suggest total sum insured for your extreme mountaineering policy to be 30,000 USD per person per accident. The most expensive part is usage of a helicopter. We don’t arrange policy. It’s necessary to get it in your country before the expedition. 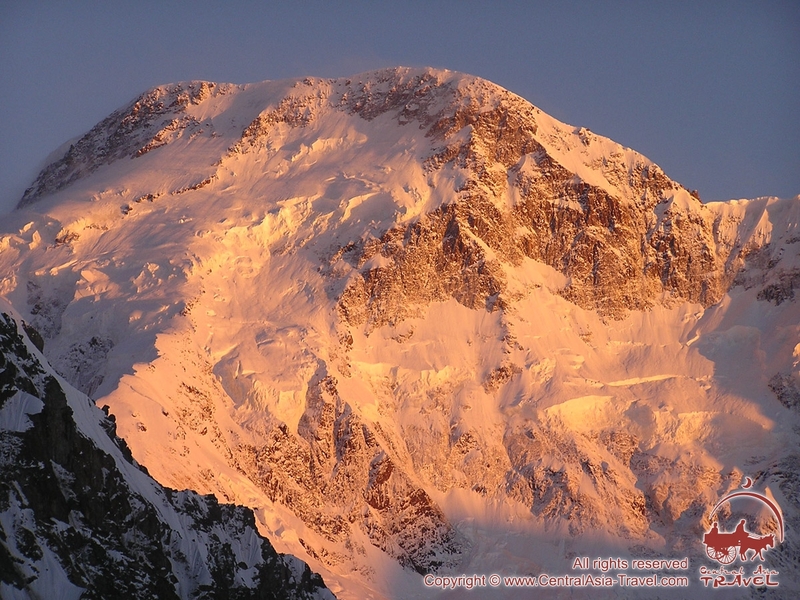 The first mountaineers conquered in 1938 formerly unknown peak. 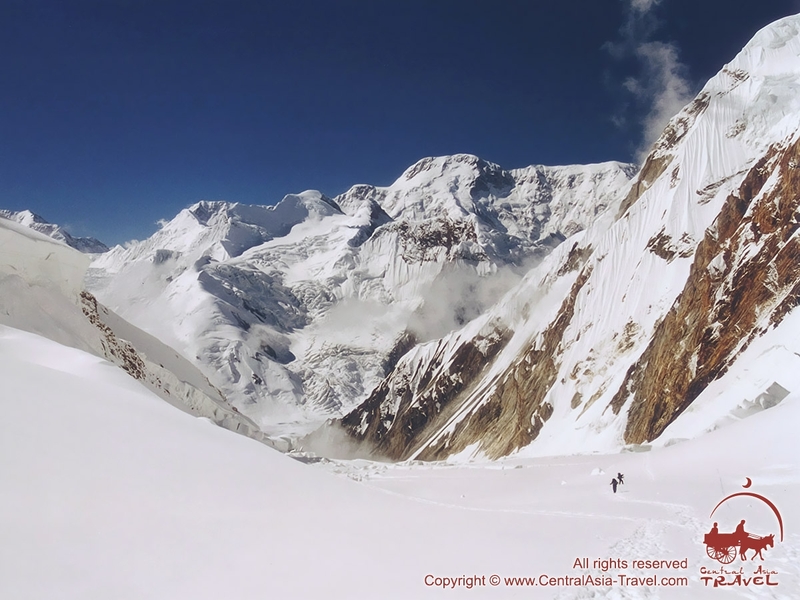 There are some difficult routes to the top as follows: - on the centre of the northern slope; - on the eastern crest from Chon-Teren pass, and - along (most safe way) over the west Pobeda summit (also called Vazja Pshavela) from the Diky pass. 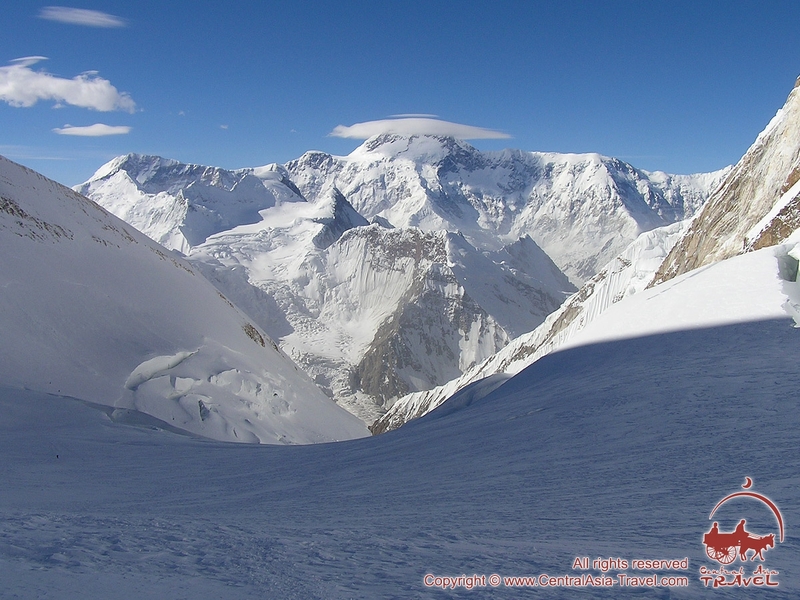 Start from Zvesdochka glacier from icefall at 4,500 m, altitude difference about 3 km. Icefall and the northern ridge of West Pobeda (6,918 m), then long traverse of the western crest (4 km) at the altitude of 7,000 m.
During the day you should reach the summit and return to the West Pobeda snowcave camp. Dexamethasone (edema of the brain) inj. By 1 ml. Trental (widen peripheral vessels against frostbite) pills, 2 inj. By 5 ml. Ksantinola nicotine (widen peripheral vessels against frostbite) pills,inj by 2ml. Sulphokamokaine (breathe/heart stimulant) inj. By 2 ml.